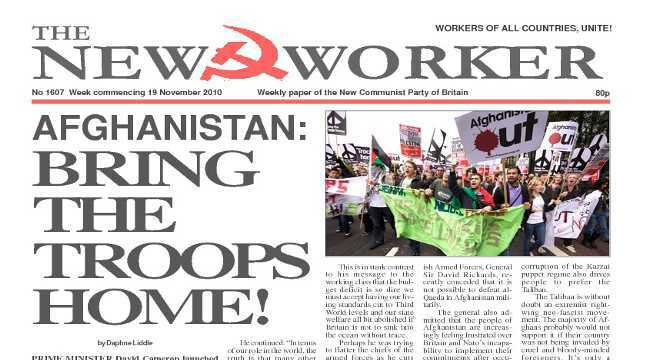 www.newworker.org | 19th November 2010 - AFGHANISTAN:BRING THE TROOPS HOME! PRIME MINISTER David Cameron launched into a jingoist rant in his speech at the Lord Mayor’s Banquet last Saturday. He boasted to the well-fed heads of British capitalism that: “Britain remains a great economic power” and a mighty military power. NEW RESEARCH on how the rich and big business in Britain avoid paying their taxes provides clear evidence — if any were needed — that the Con-Dem coalition’s attack on the public sector and vital services is not due to economic necessity but is an all-out political assault on the working class. THE STUDENTS who invaded and trashed the Tory party headquarters last Wednesday provoked a polarised response. The National Union of Students general secretary, Aaron Porter, condemned the violence absolutely and said it distracted from the main message of the massive students’ demonstration. The media condemned “the violence” and reporters at the scene interviewing students in general pressed them hard to get them also to condemn their less inhibited colleagues. Prime Minister David Cameron has set out to waste millions of pounds on a survey into whether the people of Britain are happy or not.